themulhern: A grim doom, lots of fighting, hidden identities, slightly different elves. A must-read for diehard Toliken fans. The text of this work was written much earlier than The Hobbit or The Lord Of The Rings, and as such the prose has a more "grand" (or perhaps "literary") style, more like The Silmarillion or The Fall Of Gondolin. For all that, it's still very readable. More fleshed out story from the Elder Days then what we first read in The Silmarillion, but very dark nonetheless. This is a sad tale very similar to those great Greek tragedies, because when the gods play with men’s lives and focus their attention on crushing their will, the lengths and depths to which they will sink to have their vengeance holds no mercy, no matter how brave or heroic those within their power try to be. The Great Evil of the land will have its way, especially if the other Gods sit in the Land of Valar and do nothing but let Morgoth’s will flourish in Middle Earth. Christopher Tolkien has brought together his father's text as well, I think, as he can. 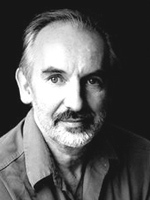 In an afterword, he attests to the difficulty his father had in imposing "a firm narrative structure" on the story, and indeed it does give the impression of simply being one damned thing after another, with the hero, Túrin, stomping around the forests in a continuous sulk at his fate, much of which, it seems, he has brought upon himself. As to whether the story brings out the feeling of "deep time" which Tolkien considered one of the duties of his brand of imaginative literature, I cannot really tell, for I do not take this kind of thing as seriously as I did when I was a boy and feel that perhaps the onus for the creation of such a sense of wonder is being placed too much on the reader. Actually, the First Age here seems a pretty miserable place to be; Orcs everywhere, people being hunted into outlawhood or beggary, and with no relief, light or otherwise, from a grumpy, pipe-smoking wizard. But it does have a strange atmosphere all of its own. Maybe it does work. Inspired by the Norse tale of Sigurd and Fafnir, Tolkien first wrote a story about a dragon in 1899, at the age of 7. At school he discovered the Kalevala, a Finnish epic poem, and by 1914 was trying to turn the tale of Kullervo into “a short story somewhat on the lines of Morris’s romances”. By 1919 he had combined these elements in what became the tale of Túrin Turambar. The book is beautiful, but other than the atmospheric illustrations by Alan Lee, and a discussion of the editorial process, much of what lies between the covers was actually published in either The Silmarillion (1977) or Unfinished Tales (1980). Yet this new, whole version serves a valuable purpose. In The Children of Húrin we could at last have the successor to The Lord of the Rings that was so earnestly and hopelessly sought by Tolkien’s publishers in the late 1950s. Hador Goldenhead was a lord of the Edain and well-beloved by the Eldar. For a man may love war, and yet dread many things. For victory is victory, however small, nor is its worth only from what follows from it. Let the unseen days be. Today is more than enough. The sun went down, and Morwen sighed and clasped his hand and was still; and Hurin knew that she had died. The first complete book by J.R.R. Tolkien in three decades--since the publication of The Silmarillion in 1977--The Children of Húrin reunites fans of The Hobbit and The Lord of the Rings with Elves and Men, dragons and Dwarves, Eagles and Orcs. Presented for the first time as a complete, standalone story, this stirring narrative will appeal to casual fans and expert readers alike, returning them to the rich landscape and characters unique to Tolkien. How did a lifetime of stories become The Children of Húrin? In an essay on the making of the book, Adam Tolkien, grandson of J.R.R. Tolkien (and French translator of his History of Middle-earth), explains that the Húrin legends made up the third "Great Tale" of his grandfather's Middle-earth writing, and he describes how his father, Christopher Tolkien, painstakingly collected the pieces of the legend into a complete story told only in the words of J.R.R. Tolkien. "For anyone who has read The Hobbit and The Lord of the Rings," he writes, The Children of Húrin "allows them to take a step back into a larger world, an ancient land of heroes and vagabonds, honour and jeopardy, hope and tragedy." Amazon.com: How much of a treat was it to get first crack at depicting entirely new characters rather than ones who had been interpreted many times before? Was there one who particularly captured your imagination? 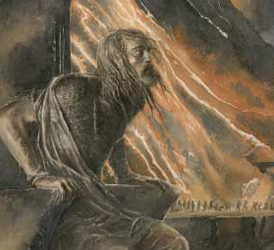 Lee: Although it was a great honor to illustrate The Children of Húrin, the characters and the main elements of the story line are familiar to those who have read The Silmarillion and Unfinished Tales, and these narratives have inspired quite a few illustrators. Ted Nasmith has illustrated The Silmarillion and touched on some of the same characters and landscapes. This was the first time that I ventured into the First Age; while working on The Lord of the Rings books and films--and The Hobbit--I've had to refer back to events in Middle-earth history but not really depict them. I'm drawn to characters who bear similarities to the protagonists in myths and legends; these correspondences add layers and shades of meaning, and most of the characters in this story have those archetypal qualities. However, I prefer not to get too close to the characters because the author is delineating them much more carefully than I can, and I'm wary of interfering with the pictures that the text is creating in the reader's mind. Amazon.com: The Húrin story has been described as darker than some of Tolkien's other work. What mood did you try to set with your illustrations? Lee: It is a tragic story, but the darkness is offset by the light and beauty of Tolkien's elegiac writing. In the illustrations I tried to show some of the fragile beauty of the landscapes and create an atmosphere that would enhance the sense of foreboding and impending loss. I try to get the setting to tell its part in the story, as evidence of what happened there in the past and as a hint at what is going to occur. My usual scarred and broken trees came in handy. Amazon.com: You were a conceptual designer (and won an Oscar) for Peter Jackson's film trilogy of The Lord of the Rings, which I think we can safely say had a bit of success. How does designing for the screen compare to designing for the page? Lee: They both have their share of joys and frustrations. It was great to be part of a huge film collaboration and play a small part in something quite magical and monumental; I will always treasure that experience. Film is attractive because I enjoy sketching and coming up with ideas more than producing highly finished artwork, and it's great having several hundred other people lending a hand! But books--as long as they don't get moldy from being left in an empty studio for six years--have their own special quality. I hope that I can continue doing both. Amazon.com: Of all fiction genres, fantasy seems to have the strongest tradition of illustration. Why do you think that is? Who are some of your favorite illustrators? Lee: A lot of excellent illustrators are working at the moment--especially in fantasy and children's books. It is exciting also to see graphic artists such as Dave McKean, in his film Mirrormask, moving between different media. I also greatly admire the more traditional work of Gennady Spirin and Roberto Innocenti. Kinuko Craft, John Jude Palencar, John Howe, Charles Vess, Brian Froud ... I'll stop there, as the list would get too long. But--in a fit of pride and justified nepotism--I'll add my daughter, Virginia Lee, to the list. Her first illustrated children's book, The Frog Bride [coming out in the U.K. in September], will be lovely. Visit our J.R.R. 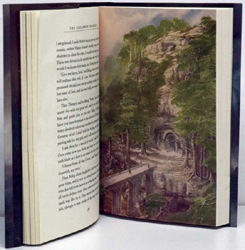 Tolkien Store for a complete selection of Tolkien classics, including deluxe editions, young readers' editions, and more.